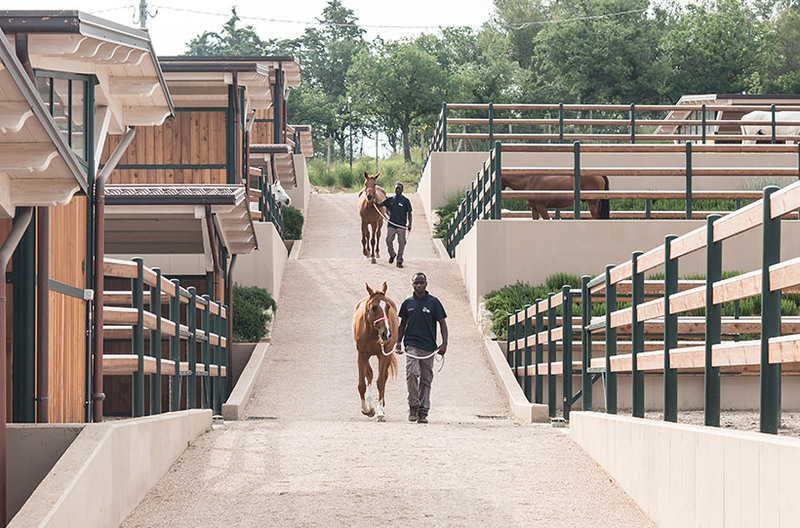 Welcome to the ideal place for guaranteeing the best conditions for horses, riders, and professionals every day, offering the highest level initiatives. 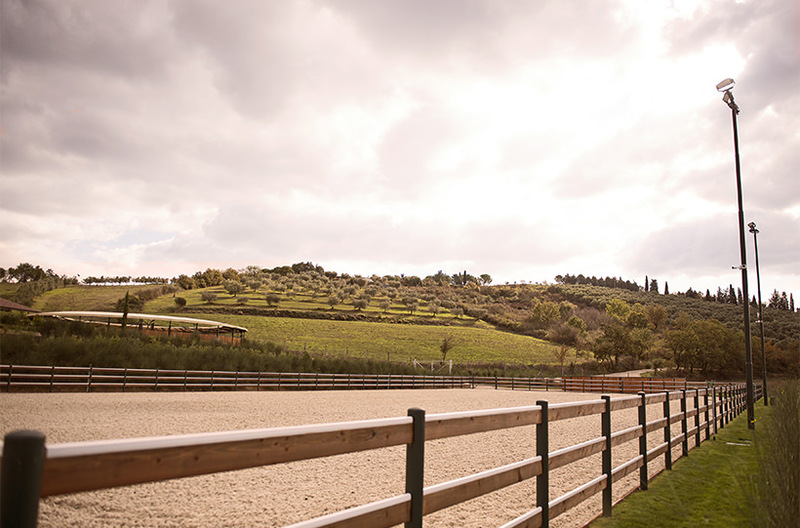 Welcome to the headquarters of Italia Endurance Stables & Academy, cutting-edge facilities conceived to be as functional as possible: 800 square metres of overall surface area, with twenty-four boxes (3.15 x 3.5 metres each), as well as medical facilities, a tack room, washing and saddling areas, changing rooms, and bathrooms. Each box has a large window facing outside. Air is able to circulate thanks to bottom-hung windows and copper vents placed on the top of the roof. 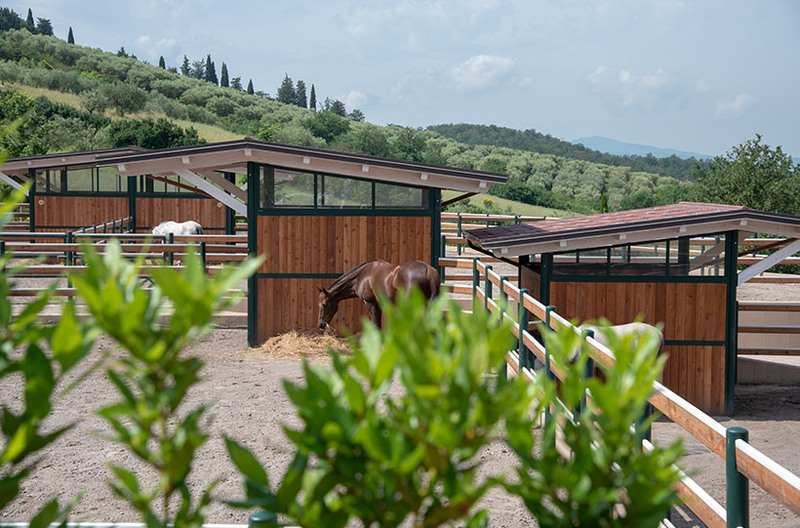 This building in the Agello hills is the product of innovation in terms of the facilities as well as in terms of how the horses are cared for. Special consideration has been given to the environmental impact, through the use of a variety of fine materials used in the most harmonious way: mauve wood from Africa, pietra serena, zinc-coated steel painted British-racing green with an epoxy, copper, and lamellar in bleached spruce used for the ceilings. 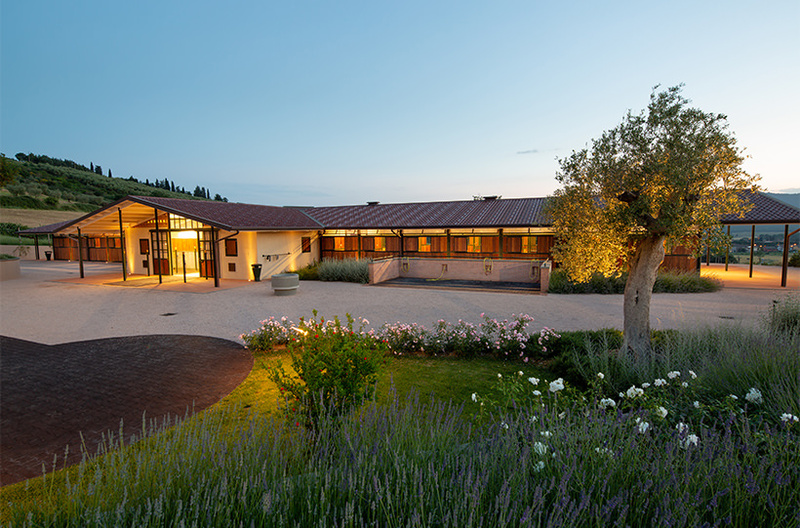 The result is a facility that perfectly fits in with the aesthetic of the surrounding Umbrian countryside, aiming to blend in wonderfully, bringing together elegance and efficiency. 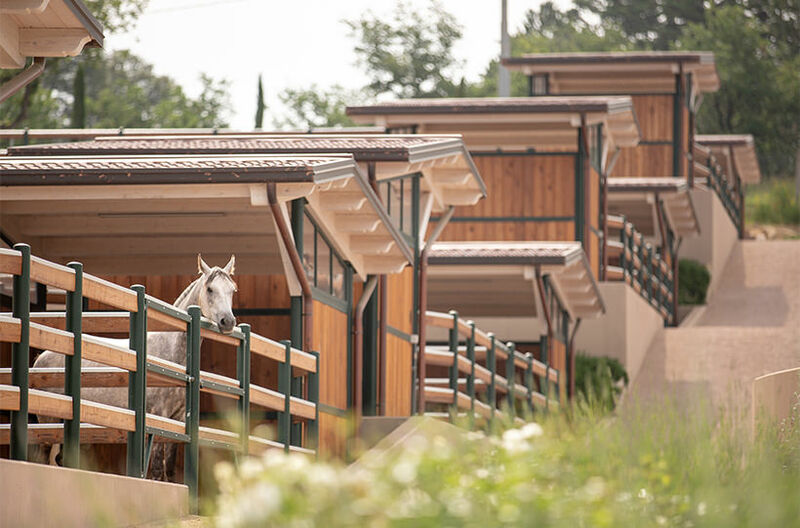 There is a modern, comfortable trotting lane located in the shade of the large oak tree and the olive trees surrounding the stables: a 40-metre straight lane enclosed by a 15-metre circle, set alongside the main section of the facility and perfectly immersed in the architectural and natural context of the entire complex. 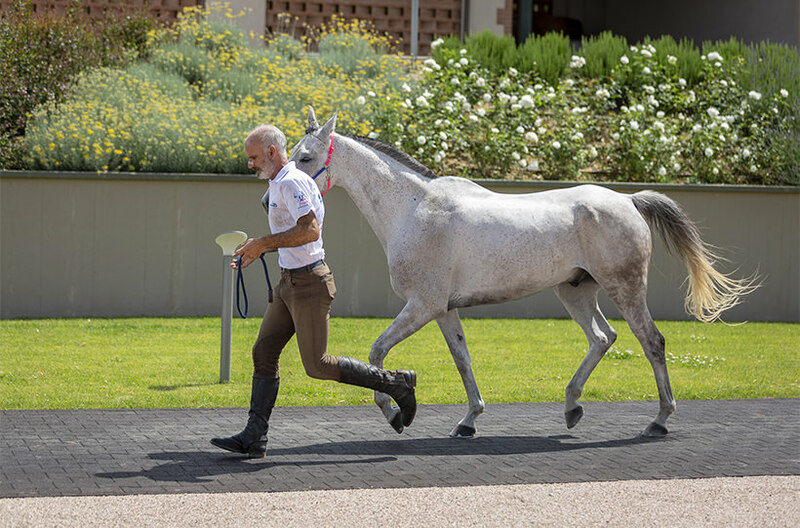 The trotting lane has been conceptualized to be even more practical, allowing the technical and veterinary staff to watch the gait of the horse and monitor its motor skills. 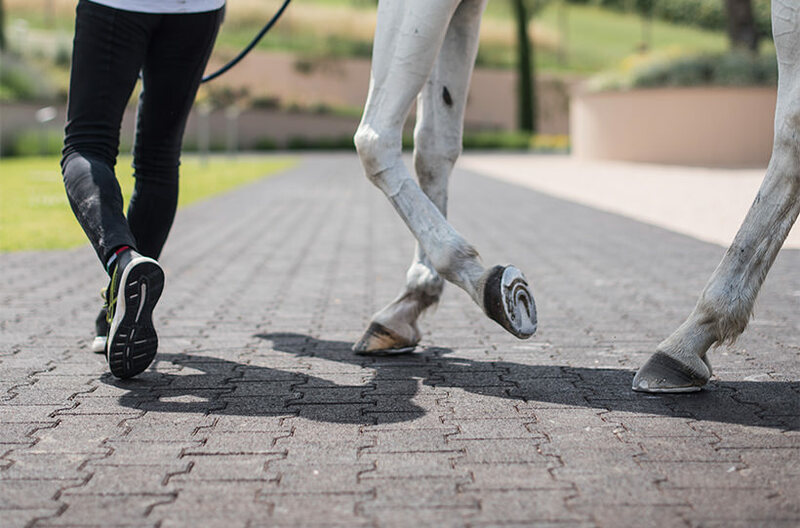 Horses trot on a rubber surface specially made for equestrian use, created in non-toxic, eco-compatible materials that fully respect the environment. 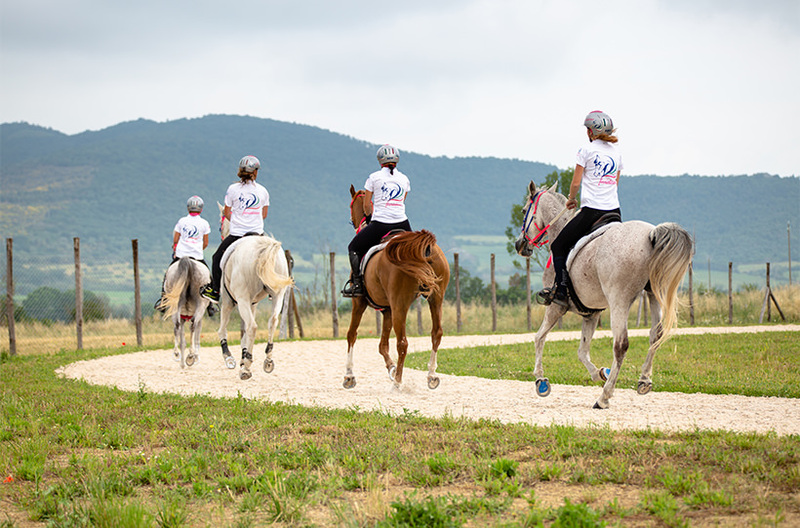 Our passion and great love for horses can also be seen in the important choices that have inspired the entire project, and, specifically, the choices behind creating the best living conditions possible for our wonderful companions on this journey. 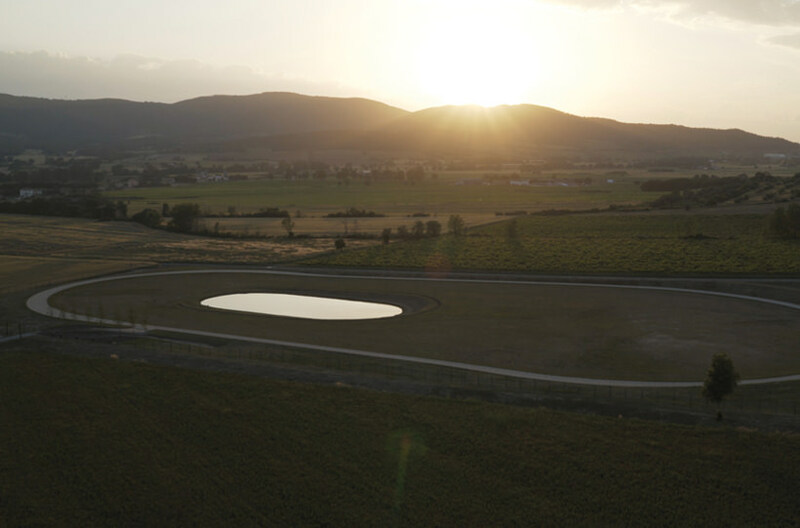 There are twenty-one paddocks in an area larger than 4,000 square metres. 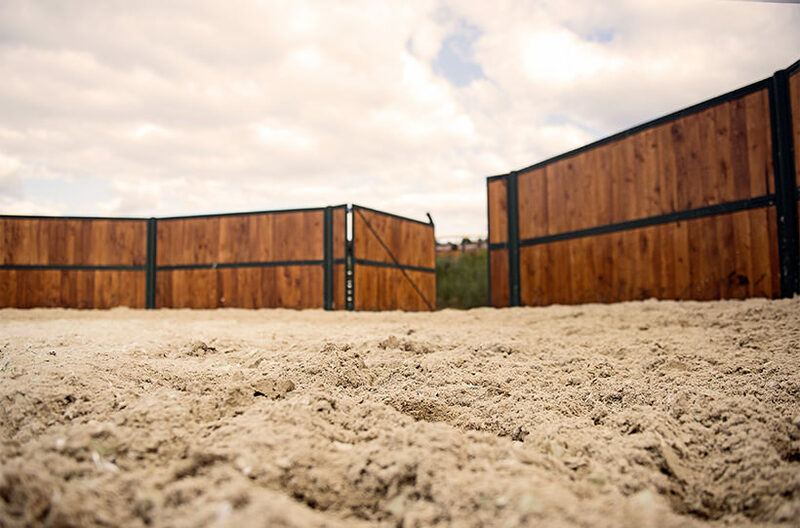 Each paddock is fenced in with larch panels featuring a bite-proofing solution, and each one has a wide shelter that has been built with the same fine materials that the entire complex boasts. Special attention has been paid to the porous pavement made up of a mix of silica sand and peat. 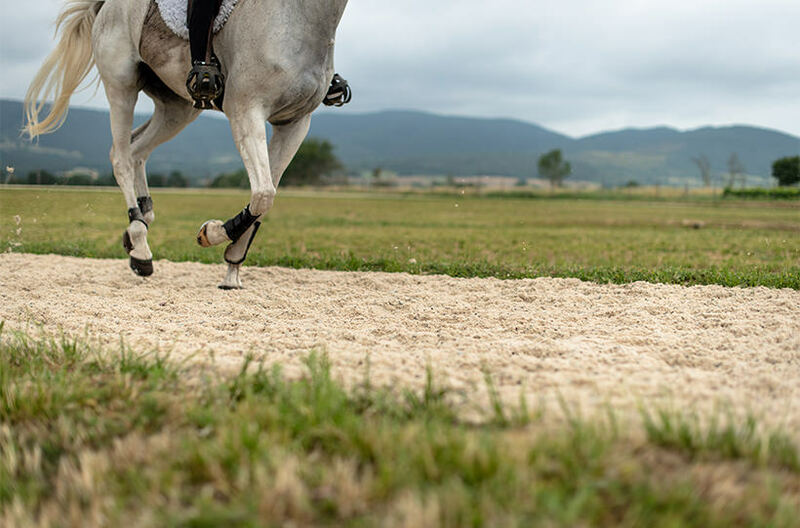 This is fundamental for protecting the horse’s feet, even in the most difficult weather conditions. 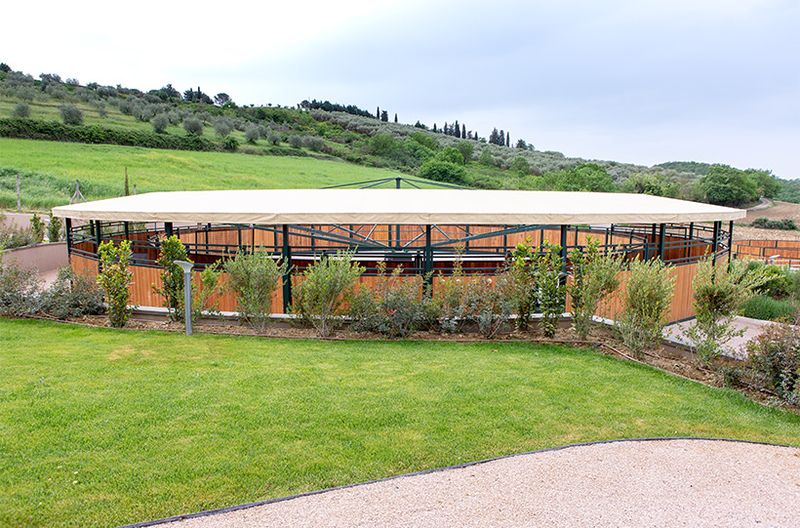 Another feature that is certainly not secondary is that each paddock, which extends over about 200 square metres, offers a view of the horizon so the horses don’t get bored. 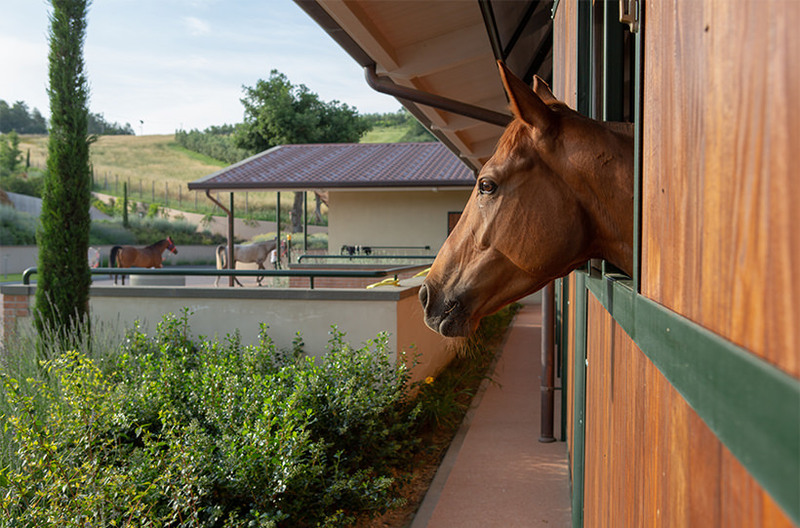 Those who walk among the terraced areas of the paddock also don’t get bored, as they enjoy the affection of the horses and the incomparable appeal of the Umbrian countryside. 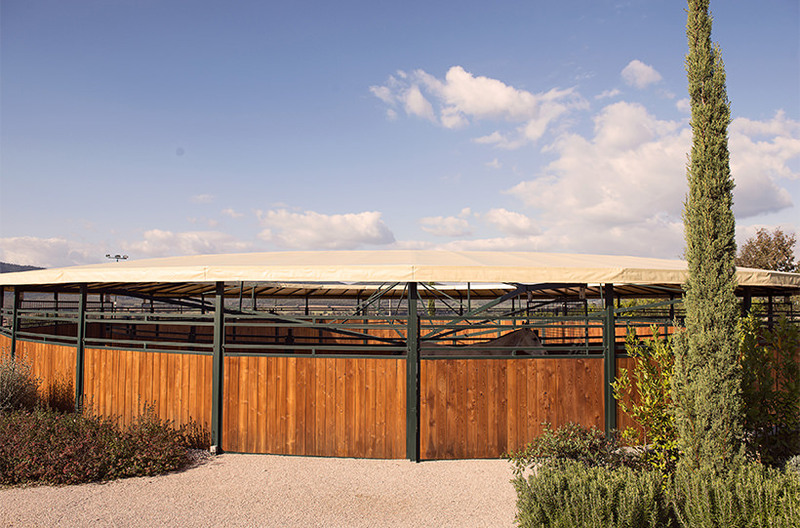 The covered walking machine is one of the many facilities used for training, allowing the horses to be kept in shape or at active rest. This facility also blends in harmoniously with the entire complex, featuring the same building materials: larch and zinc-coated steel. 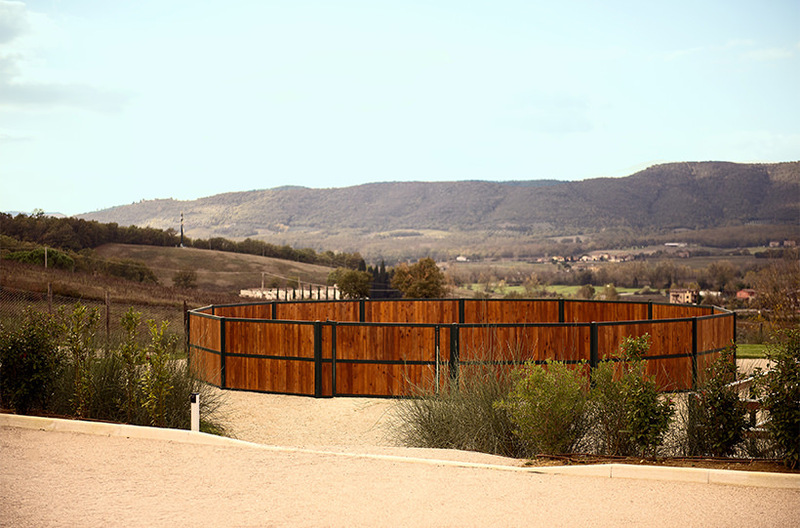 It has an outer diameter of 22 metres and flooring made out of rubber tiles meant for equestrian use. 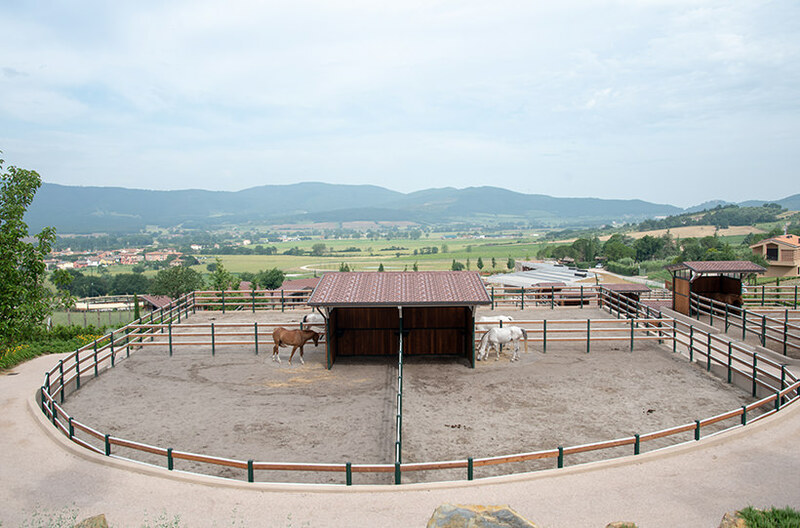 This is an area of fundamental importance that serves various functions, allowing for the training of foals as well as young horses. 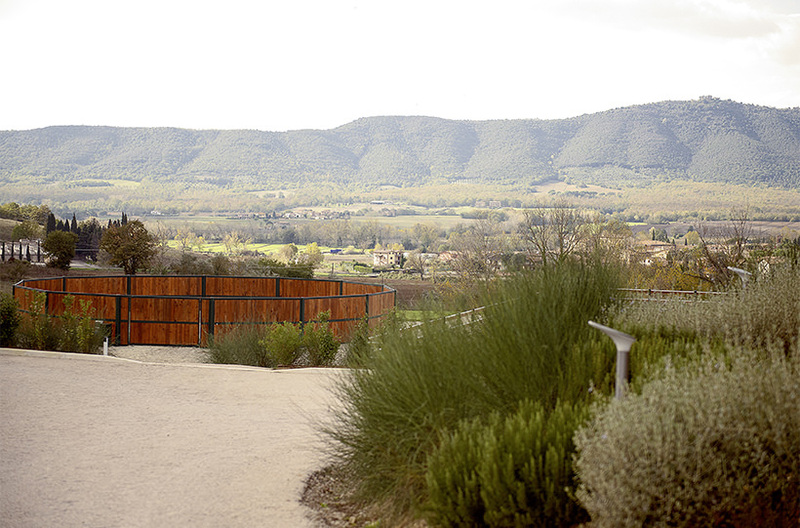 It is located near the walking machine and is another of our many facilities to be enjoyed. It has a diameter of 14 metres and was built with the same materials as the rest of the complex. One of the themes of the entire complex is how each area has specially studied flooring. In this case, a silica-sand additive has been combined with polypropylene and shredded nonwoven fabric. 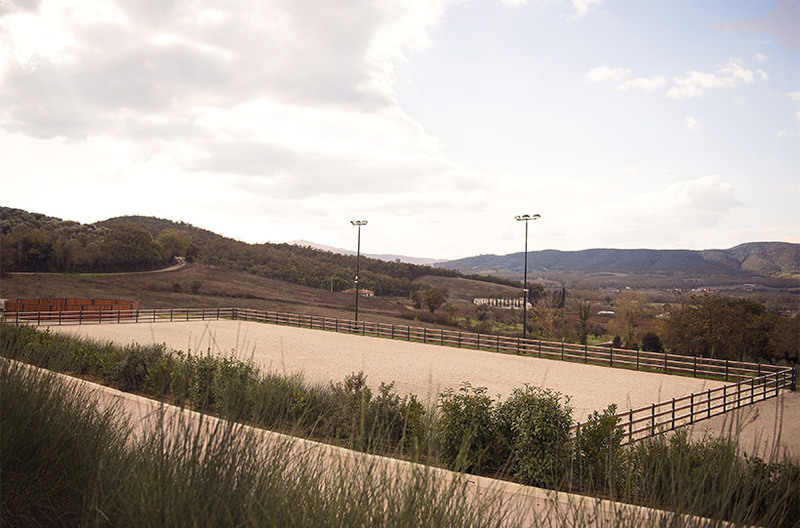 Another important area in the complex is the field, measuring 30 x 60 metres and with flooring in natural silica microsand with perfect granulometry and fibre – it is thick enough to offer excellent firmness and elasticity. The field is fenced in with larch planks. 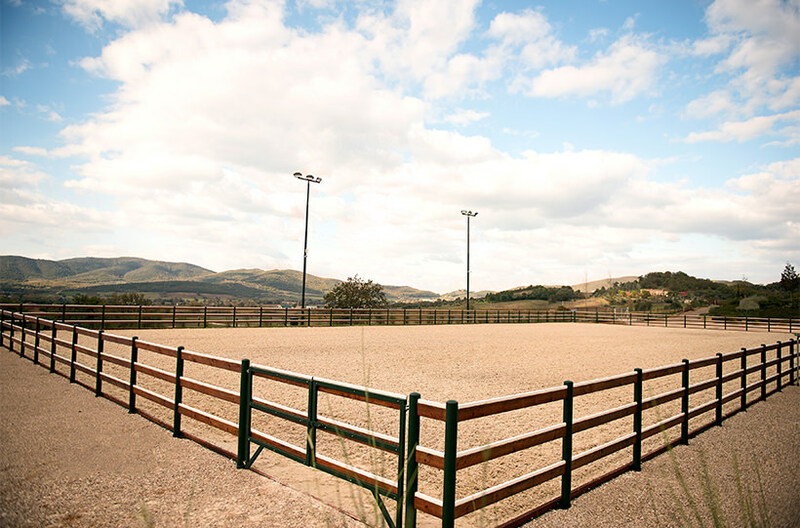 The field is used for working with young horses and training riders. 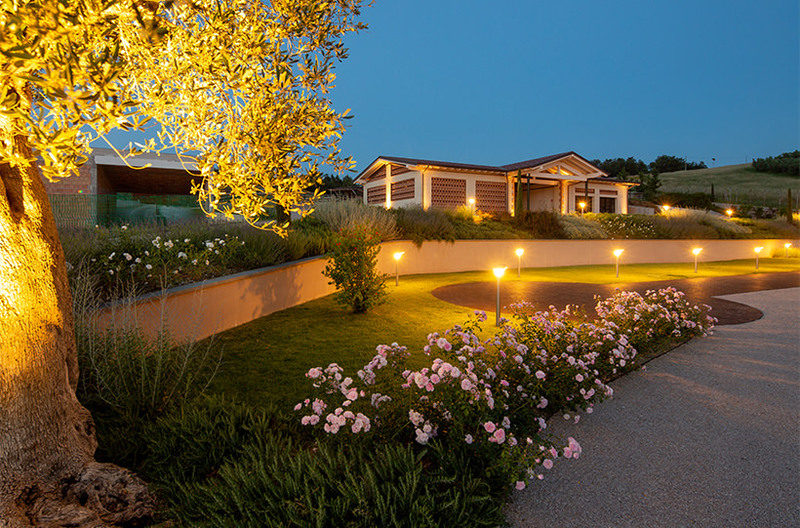 An LED system – with six high-powered, energy-saving spotlights mounted on 12-metre poles – offers optimal lighting. 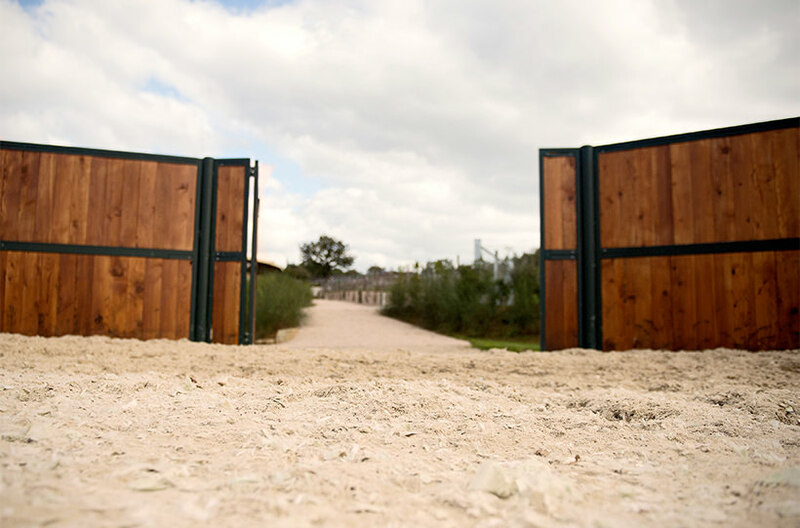 What’s more, for events held at the Italia Endurance Stables & Academy, the field in sand serves as a “vet gate” where veterinary inspections are held. The barn is downhill from the paddocks, and slightly elevated as compared to the stables. This is where we store animal feed and equipment. 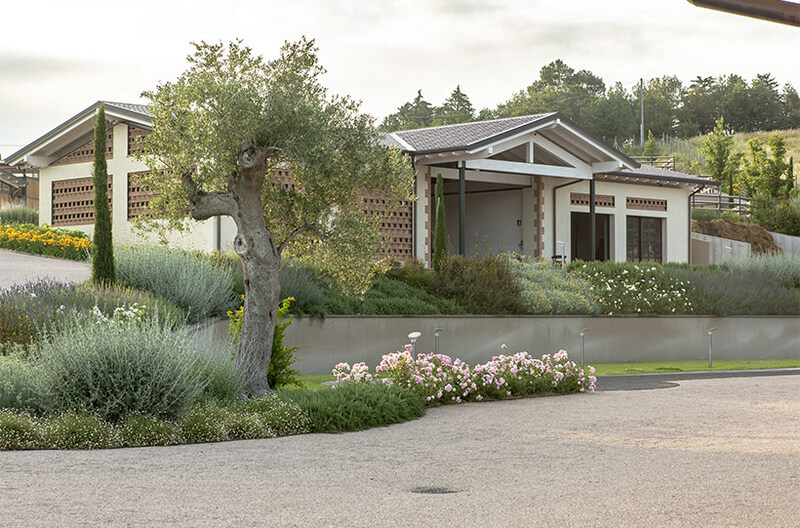 This part of the property has also been built using the finest materials like lamellar wood, with bleached spruce for ceilings and zinc-coated steel for vertical elements. Infill walls are made of bricks as per local rural tradition in the area where the stables are located. No detail has been overlooked. 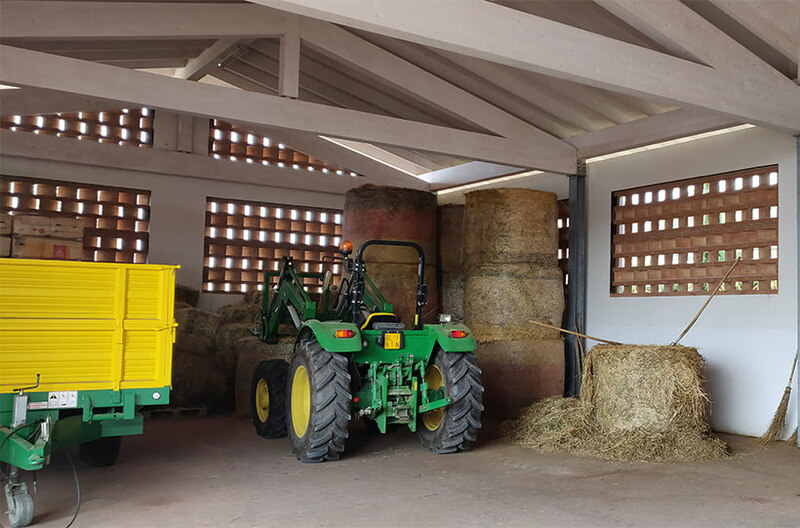 In fact, large windbreaks have been placed and studied carefully to guarantee necessary air circulation so that the animal feed is properly stored. 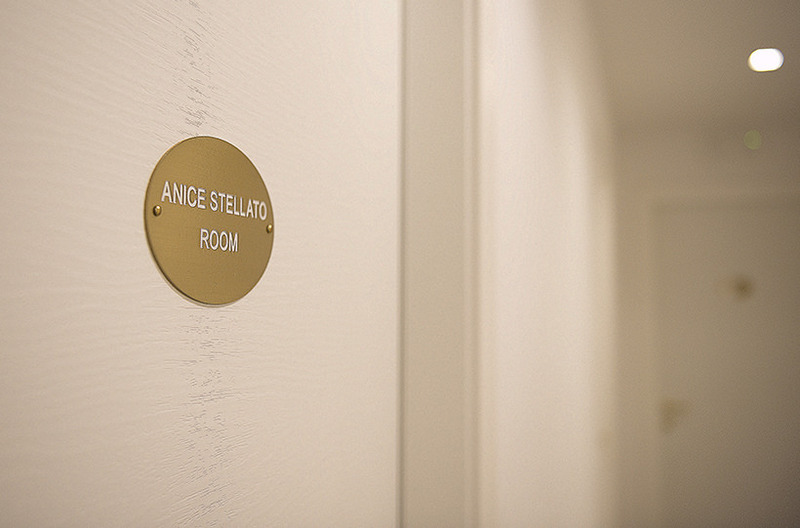 “Writing means always hiding something so that it is then discovered,” said Italo Calvino, and this is the inspiration behind the building’s architecture. Hiding, integrating, and blending in with the surrounding vast natural environment, to then be found only when needed. Nature’s embrace and the embracing of nature are reflected in the building’s facade. 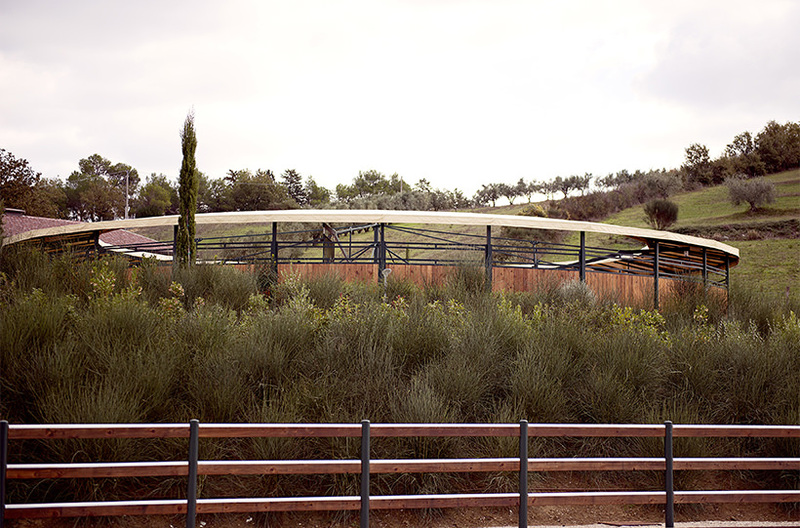 The Club House is a grass-covered structure that is the beating heart, the perfect place for holding events in the complex. Features include a Majilis, which dominates the horizon from its position atop the stone tower incorporated into the structure, a restaurant, a lounge bar, a gym, and all related services. 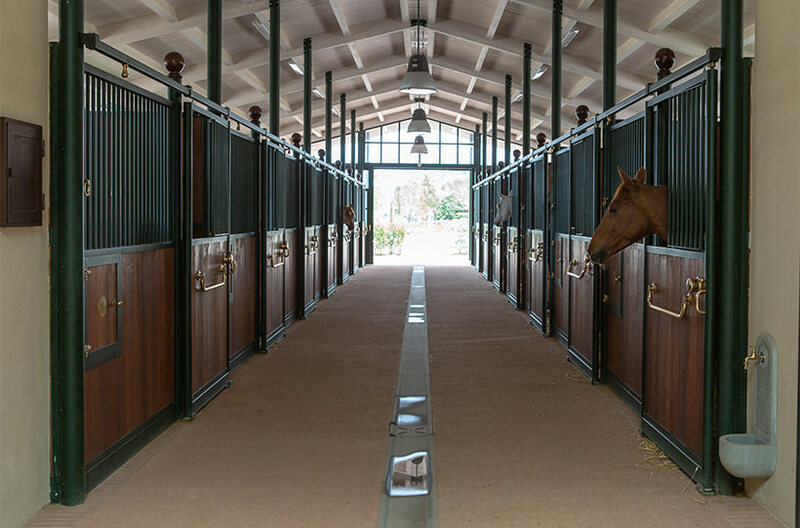 Faced to Dubai Square, the Club House, with its more than 700 square metres in size, allows for holding social and press events, giving guests the opportunity to experience the stables in an enjoyable and interesting atmosphere. The infinity pool (18 x 5 metres) outside the Club House overlooks the splendid valley that surrounds the property, offering the most complete view from inside the complex. 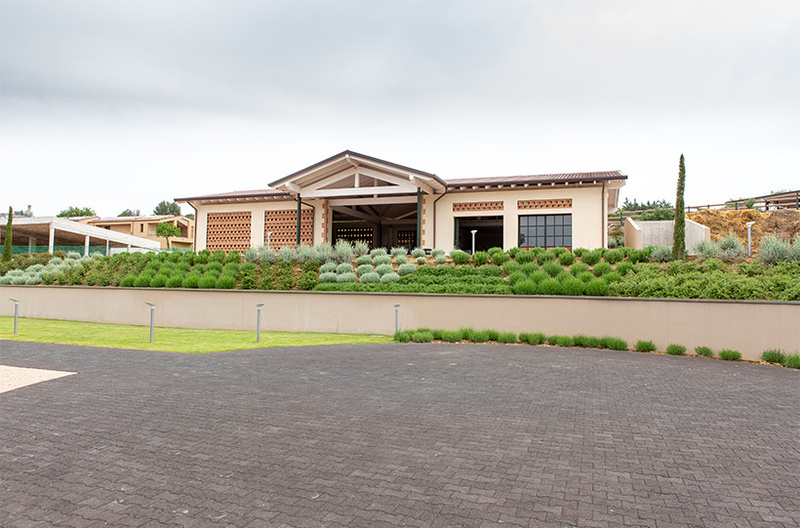 The Guest House has an overall surface area of 500 square metres, subdivided over two floors. 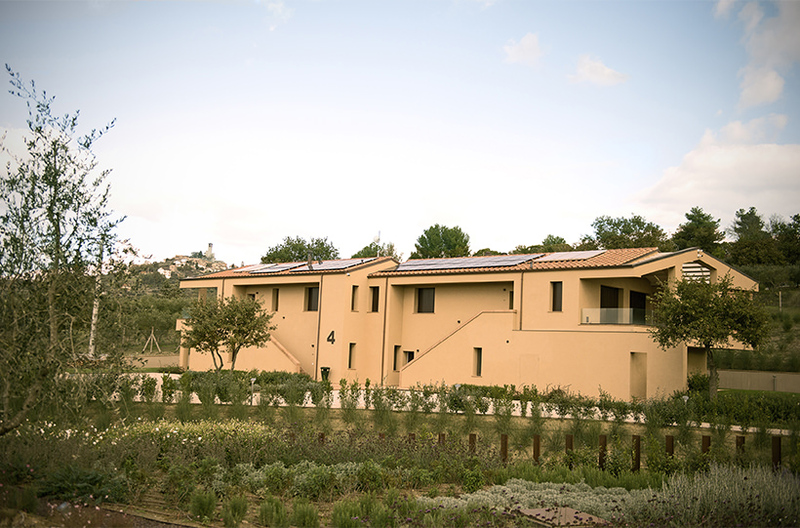 The left part is divided into two apartments with independent heating and cooling systems, with heat in the winter and cool air in the summer guaranteed by a heat pump and terminal units in the floor. 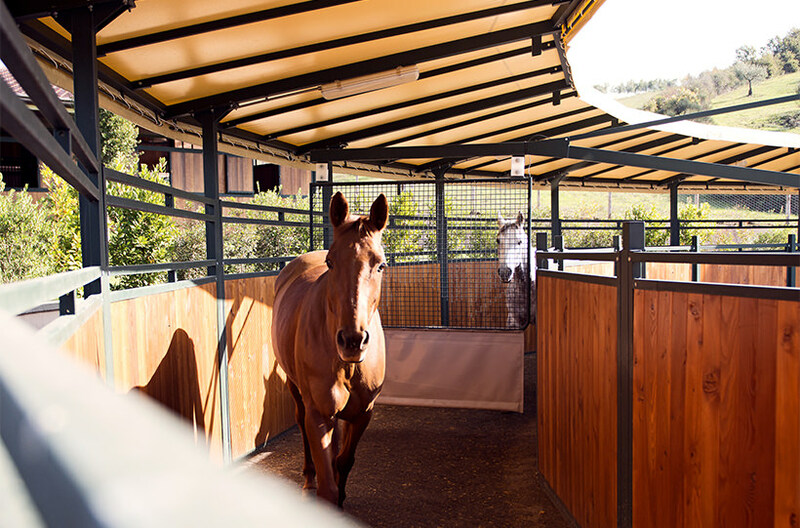 An air-treatment system inside the property maintains humidity at proper levels. 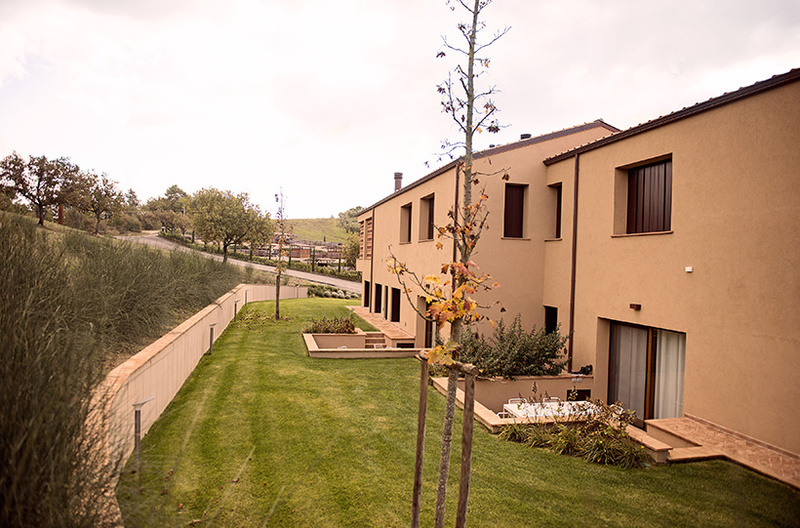 The apartment on the ground floor offers access to a courtyard off of the rear while the first-floor apartment has a wonderful terrace covered in lamellar wood. On the right side of the building, there are guest lodgings on the ground level, including a common area with bathrooms, a kitchen, and three double rooms with private bathroom. 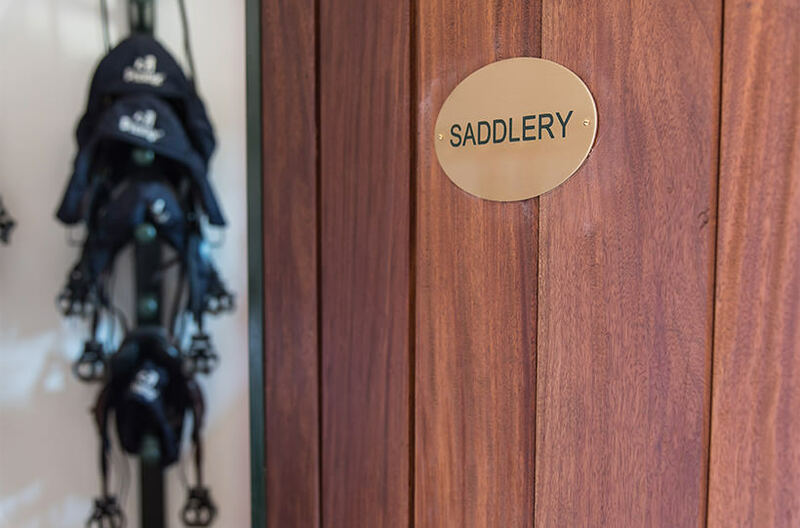 The VIP SUITE is located on the first floor. It is more than 100 square metres in size and boasts a wide selection of comforts as well as a wonderful porticoed terrace with a wooden roof. 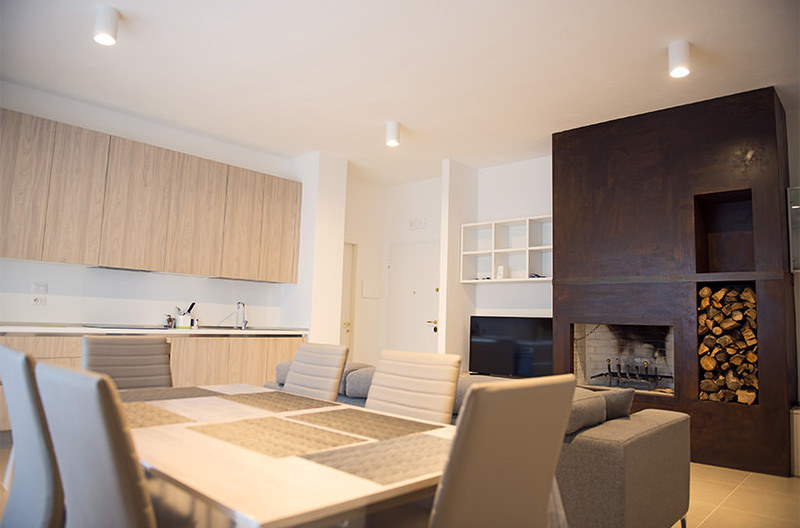 The furnishings are well appointed down to the smallest detail, and prestigious building materials along with cutting-edge systems guarantee comfortable, modern interiors throughout the property, able to satisfy all guest needs. 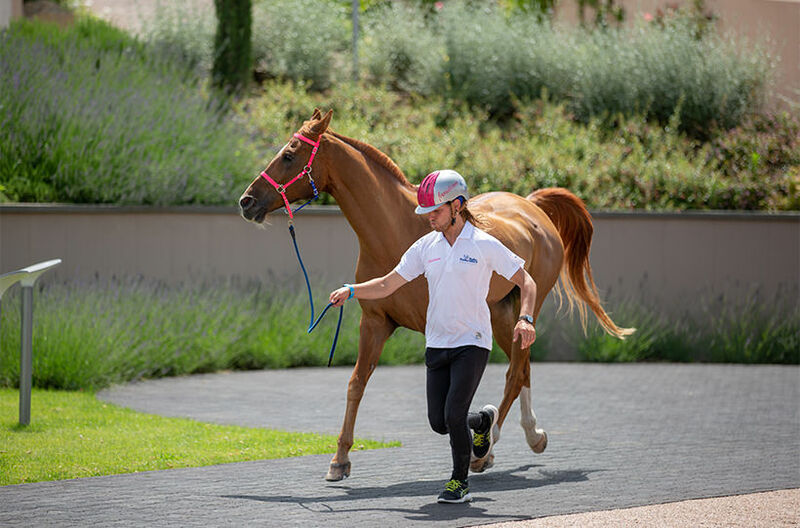 The all-weather Track is 700 metres in length and is the most amazing feature of the entire complex. 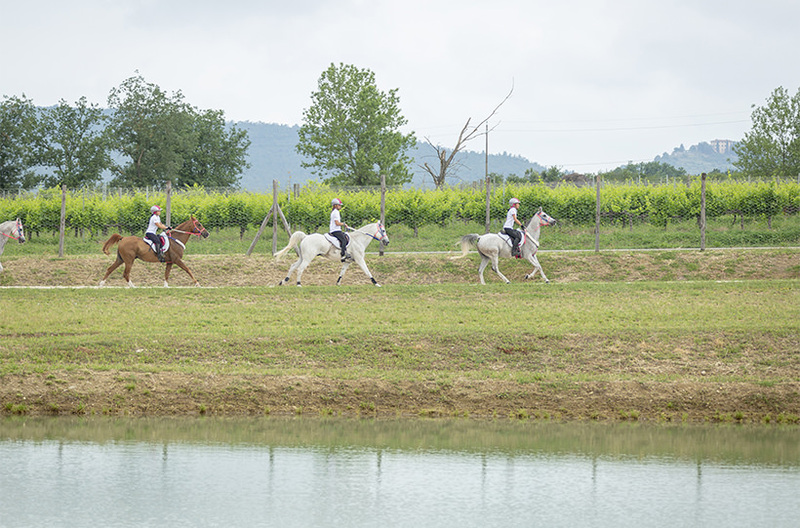 It is used to train horses, maintaining the same conditions from temperatures of -10 °C to +40 °C. 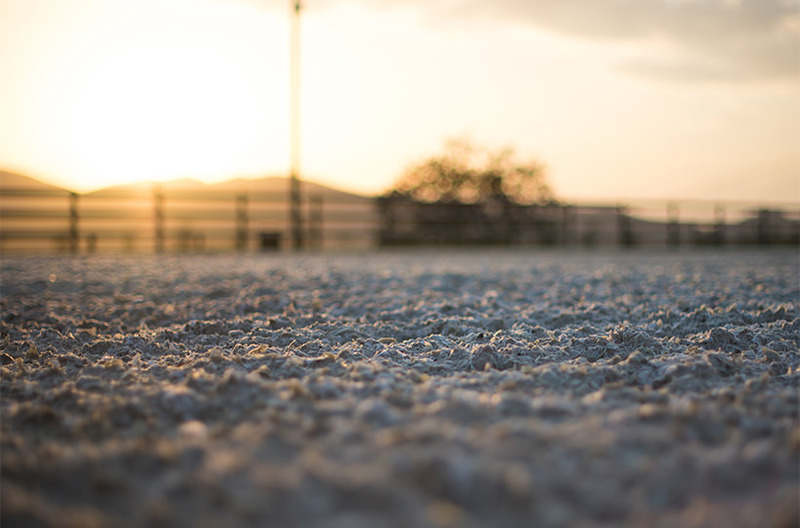 What makes it special is its unique surface made up of elastic fibres along with silica sand, allowing it to remain stable and free of dust even in adverse weather conditions. The straight stretches have a constant 3% gradient difference while the parabolic curves have a 4% radial slope toward the inside. The Track is also perfectly integrated in the surrounding natural setting thanks to a lake, which is also home to pelagic organisms.